wanderlust ATLANTA: Cover: Drink in Design, Every Month! The Museum of Design Atlanta (MODA) is one Atlanta treasure that I wouldn't give up for anything and one of my "I'll-never-let-it-expire" museum memberships. I recently went to again see "Skate It or Hang It!? The Evolution of Skateboard Art." The hundreds of skateboard decks on display range significantly in style, but all are characteristically skateboard art. Not being a skateboarder, that's difficult to explain, but having been around skateboards since the 1970s, I know it when I see it...it's one of those things. 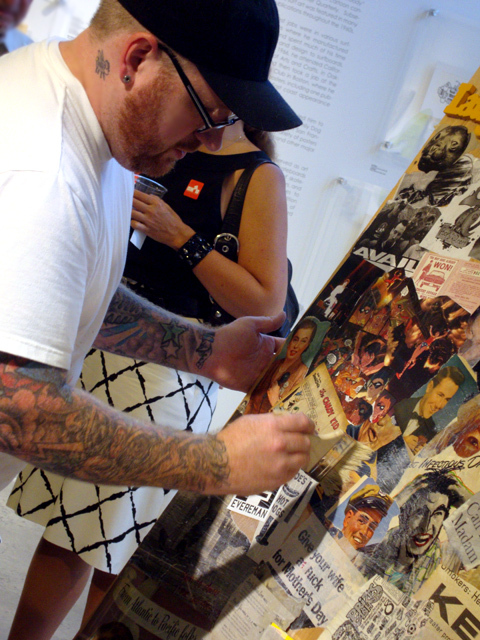 On this last visit, during 'Drink in Design', we got to see Chris Hamer of Urbanpop in action! He created a work of art from objects submitted by museum members and visitors...he even got that evening's attendees involved in the creative process. I went straight from the office so was still in corporate garb. Chris totally impressed me in that he didn't let my stuffy attire and conservative haircut get in the way of being incredibly welcoming and friendly...great energy! We'll get to see Chris again at Dragon*Con in just a few weeks...so excited! About Dragon*Con and seeing Chris again. This month's Drink in Design will feature Alan Benson who will discuss skateboarders-turned-artists and Georgia skateboard artists and more. Enjoy the above pre-sized Facebook Photo—a compilation of several skateboard decks on display at MODA—and then head over to the wanderlust ATLANTA Facebook Page for more....and go ahead and "Like" the Page while you're there, please.